Now there is some FUD (Fear, Uncertainty, Doubt) that this is an attack on Litecoin. However, this is unlikely because most transactions have been proportionate to their fees. In other words, you don’t see 0.0001 LTC transactions with a 0.001 LTC fee. Instead, it is more likely that the Litecoin ecosystem is simply growing. “Low” fee transactions were ignored. Why Did Transaction Fees Spike? As LTC blocks were getting fuller, people started inputting higher transaction fees so that their transactions would go through ahead of others. Wallets first were sending standard Litecoin transaction fees which then became considered “low transaction fees” comparative to these higher ones. In light of this, they were pushed to the bottom of the miner’s list of transactions to process. However, wallets with dynamic fees caught on to the trend and started increasing their own transaction fee so that their customers/users’ transactions would go through. This is what caused the overall spike in Litecoin transaction fees today. Why Has My Transaction Been Pending For Hours? At first glance, the range of block sizes from 49kb-999kb might be jarring. But the consistency of blocksizes, relative to the miners who are blocking them, should tell you two things: 1) Miners have put in soft-limits to their own blocks they’re submitting 2) The mempool is full because these soft-limits are consistently maxed out. ViaBTC only shows 749kb blocks. Litecoin Pool shows 49kb or 229kb, depending on their server. F2Pool, only 250 kb. The fact that there were over 4k unconfirmed transactions during this time period and that there are only blocksize variations between different miners tells you that each miner was maxing out their respective soft block limit. But Wait, Isn’t Litecoin’s Blocksize 1 MB? Yes it is! But pools will often input soft limits to their own blocks that they’re submitting for various reasons, one of which is to help speed the propagation of blocks along to reduce miner centralization. Therefore, soft-limits are why Litecoin’s blocks were technically full, even though they weren’t 1mb. In other words even though Litecoin full nodes enforce a 1mb protocol, miners independently were limiting Litecoin blocks to various sizes. This explains why blocks significantly lower than 1 mb were going through in light of 4k+ unconfirmed transactions. The byproduct of this cycle unintentionally increased competition in the mempool with higher transaction fees being constantly favored. This pushed lower transaction fees to the bottom of the list, as newer transactions with higher fees were favorited, causing them to not be confirmed for hours at a time. High Litecoin transactional volume combined with soft-block limits created an unintentionally competitive fee market which raised transaction fees while pushing transactions with lower fees out. Wallets with dynamic fees and Litecoin users readjusted their own fees to match the fee market in order to push transactions through. This cycle is what caused Litecoin transactions to be unconfirmed for hours. I’d be remiss not to acknowledge the possibility of this being a malicious attack from miners and perhaps a very wealthy Litecoin holder. 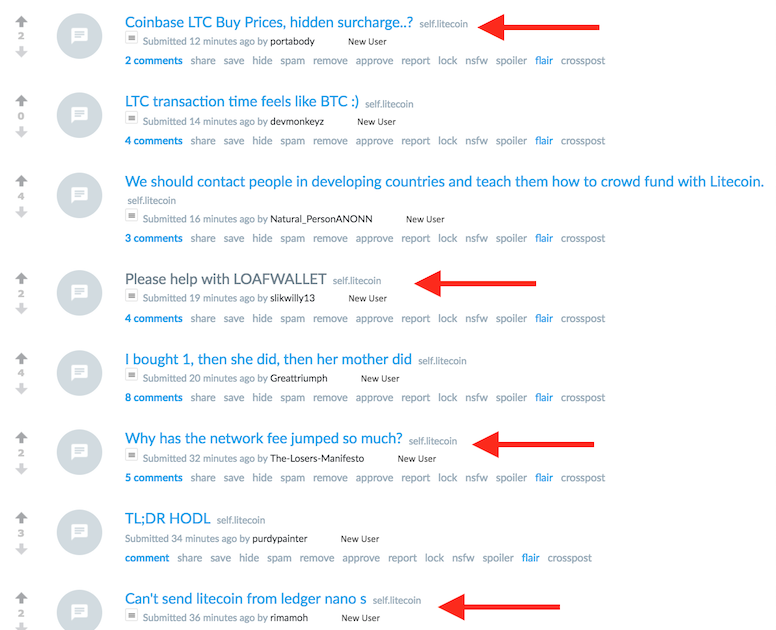 Perhaps the attacker wanted to disguise his “spam” attack by sending normal transactions with normal fees in order to exploit the artificially limited blocksizes of Litecoin. This would then create an increasingly competitive fee market artificially raising Litecoin’s fees. Miners would also benefit from consistently processing higher fees. However, this is highly unlikely as performing such an attack would be outlandishly expensive. Also, these soft-limits were set because of how open Litecoin blocks were…up until now. I fully expect miners to increase their soft-limits to match the economic demand for Litecoin. In fact, Pooler has already lifted the 30mb restriction that was being implemented on some of his servers. IMO, this is a big deal because it represents change in the Litecoin Network that was caused by transactional growth. What Caused the Sudden Increase in Litecoin Transactions? Litecoin’s Natural Growth: Last week Litecoin hit ATH’s of near $400’s. This coincided with an astounding $2.6 billion volume. Litecoin’s hash difficulty has also been rising which also means more money is coming into the ecosystem to secure it. All of these are great signs of economic growth. FUD: Yesterday, Charlie announced that he sold his Litecoins. I personally view this as a good thing for Litecoin because it frees him up from constantly defending himself. However many don’t. Coming from corporate mindsets, people assume those who work on a project will be unmotivated to work because they don’t have skin in the game. This is a false assumption and represents an incongruence of fundamental blockchain values with new investors. However, it’s possible that this mindset has led to them to transfer their Litecoins to sell. So What Can I Do If My Transaction Is Still Stuck? If your transaction is stuck, grab your private keys and perform a double-spend on Litecoin Core. Or just wait. It will eventually go through.